Citation Information: J Clin Invest. 2014;124(2):580-591. https://doi.org/10.1172/JCI71861. Point mutations in the 5′ UTR of ankyrin repeat domain 26 (ANKRD26) are associated with familial thrombocytopenia 2 (THC2) and a predisposition to leukemia. Here, we identified underlying mechanisms of ANKRD26-associated thrombocytopenia. Using megakaryocytes (MK) isolated from THC2 patients and healthy subjects, we demonstrated that THC2-associated mutations in the 5′ UTR of ANKRD26 resulted in loss of runt-related transcription factor 1 (RUNX1) and friend leukemia integration 1 transcription factor (FLI1) binding. RUNX1 and FLI1 binding at the 5′ UTR from healthy subjects led to ANKRD26 silencing during the late stages of megakaryopoiesis and blood platelet development. We showed that persistent ANKRD26 expression in isolated MKs increased signaling via the thrombopoietin/myeloproliferative leukemia virus oncogene (MPL) pathway and impaired proplatelet formation by MKs. Importantly, we demonstrated that ERK inhibition completely rescued the in vitro proplatelet formation defect. Our data identify a mechanism for development of the familial thrombocytopenia THC2 that is related to abnormal MAPK signaling. Two THC2 pedigrees with new germline alterations in the 5′ UTR region of the ANKRD26 gene. Left panels: pedigree 4 harbors the c.-128G>C mutation and pedigree 5 the c.-127delAT deletion. Black symbols stand for affected individuals, white symbols for nonaffected individuals. Right panels: analysis of the 5′ UTR region of the ANKRD26 gene (NM_014915.2). 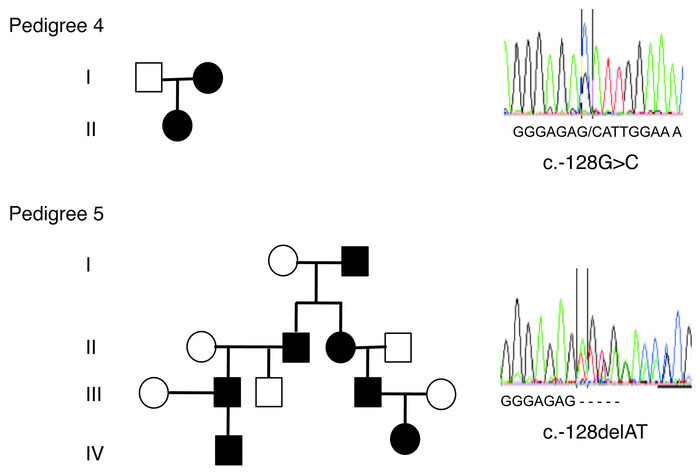 Upper panel shows the point germline c.-128G>C mutation found in pedigree 4, and lower panel shows the c.-127delAT deletion found in pedigree 5.